We’re excited to bring you a range of new products to make the home a more beautiful, fun and comfortable place to be. Children can delight in two large and colourful collections that support unlimited play and storage. The rest of the home sees a range of textiles with strong colours and bold patterns ranging from rugs to metre fabrics. Another piece of news is a swivel chair that combines beauty with ergonomics. And for cooking and eating, there are timeless cooking utensils and a dinnerware series with old folkloric patterns. We’re also launching a new range of organic coffees, and small packages of nut and fruit mixes for healthier snacking. Enjoy! 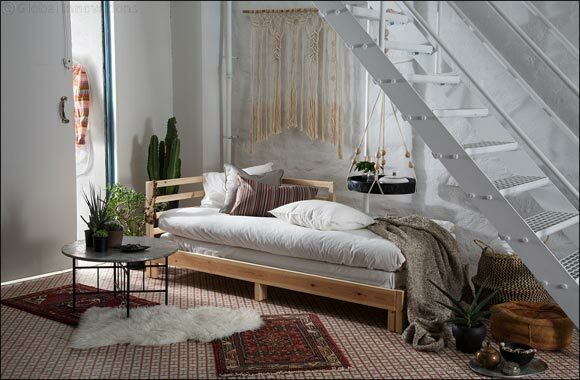 When living in a small space, it’s great to have a day bed that can act as a sofa by day, and be folded out to a double bed by night. This clever functionality is just what TARVA day bed offers, making sure every square metre comes to use. Not only does ROSENRIPS quilt cover look beautiful with its traditional Swedish pattern, there’s some real history to it too. The designer Eva Lundgren created the quilt cover with inspiration from a regional museum that houses a permanent collection of textiles dating all the way back to the 1600s from Sweden’s southernmost region. Back then women started at a young age to make pieces for their dowry that would become part of their new home once they were married. 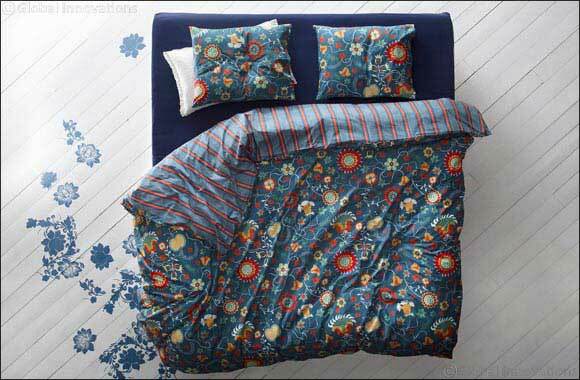 These traditional wool embroideries sparked the designer to create ROSENRIPS quilt cover. The quilt cover is made with 100% cotton from more sustainable sources, meaning the cotton is grown with less water, chemical fertiliser and pesticide, while increasing profit margins for farmers. WITH A FLORAL PATTERN ON ONE SIDE AND A STRIPED PATTERN ON THE OTHER, ROSENRIPS QUILT COVER HAS A VERSATILE DESIGN INSPIRED FROM TIMES GONE BY. 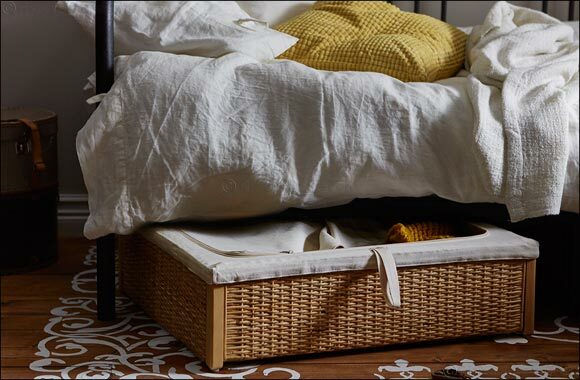 Unused space under a bed can now be turned into hidden storage space thanks to RÖMSKOG bed storage box. With a size that fits under most beds, the storage box has a zipper that prevents dust and dirt from getting into the box. Being made in rattan and cotton makes the box ideal for storing clothes in. The storage box itself has a unique, traditional look that adds style to the room. To help make bathroom time a little easier when living with kids, the designers Sarah Fager and Maria Vinka drew from their own family insights to create bathroom storage for children. The result is LÅDDAN storage consisting of a board with a mirror, hourglass, containers, bag and hook. The sand-filled hourglass marks for two, four and six minutes and can teach kids and adults an important lesson - saving water. Showers are in fact the second biggest water consuming activity in the bathroom (flushing the toilet is the first). Designed with suction cups, the storage board can be moved along the tiles as the child grows, and with the mirror made of reflective plastic film instead of real mirror glass, it’s a safe solution. Bathroom times may still be wild and crazy, but now they can be easier and educational too! Cable messes can now be dealt with swiftly and stylishly, just put them into IDEBO cable management bag! 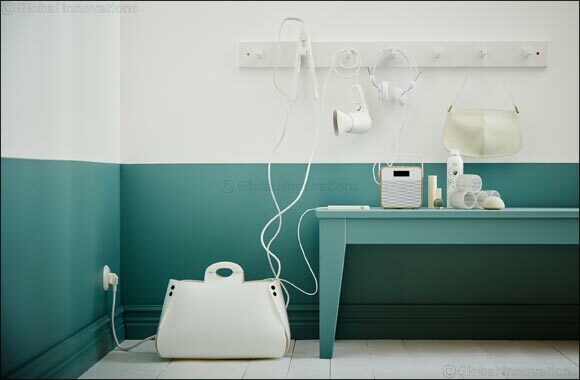 In the shape of a handbag, this is a fun, new way of storing and hiding away cables, sockets and transformers. Instead of having them attract dust on the floor, or spending time using hammers and nails or Velcro-straps to hide them away, this bag is an easy way to solve those cable challenges. Available in white or grey, the bag may also be cool enough to go shopping with! WAVE GOODBYE TO MESSY CABLES AND SOCKETS WITH IDEBO CABLE MANAGEMENT BAG, A SWIFT AND STYLISH WAY TO HIDE THEM AWAY. 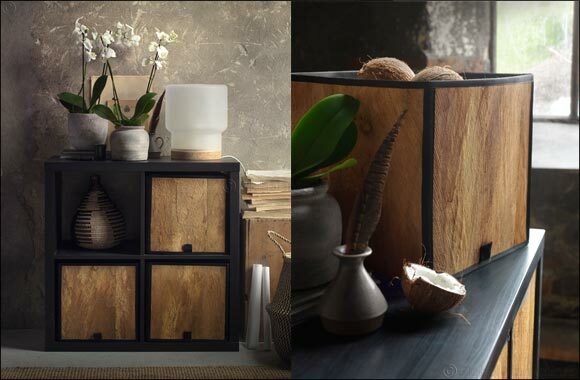 Opening up new possibilities for attractive storage, DOMPEN basket is a perfect fit in KALLAX shelving unit. The square-shaped natural fibre box has an outside made of coconut palm leaf, a renewable material, and a little handle that makes it easy to pull out from the shelf. Use the basket to store anything from newspapers to memorabilia, while creating a natural-looking style in the home. Choosing the right frame can really add to a work of art. The black SKATTEBY frames give a sturdy and heavy look, while being made in a material - a mix of wood scrap and plastic - that makes them very light and easy to put up on the walls. Available in two sizes, the simple yet decorative frames make it enjoyable to get framing. 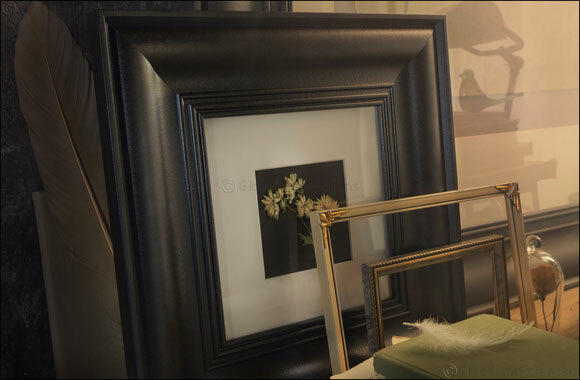 CHOOSING THE RIGHT FRAME CAN REALLY ADD TO A WORK OF ART, LIKE THE SMALL, BLACK SKATTEBY FRAME. 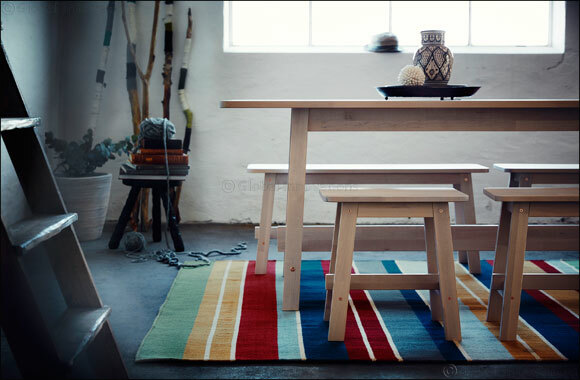 Handwoven in wool, the rug is made in the IKEA initiative of handwoven rugs in India. Striped in twelve different colours, HALVED rug creates a colourful statement in connection to a sofa or dining table. With so many delightful tones, it’s bound to coordinate with the rest of the home interior. 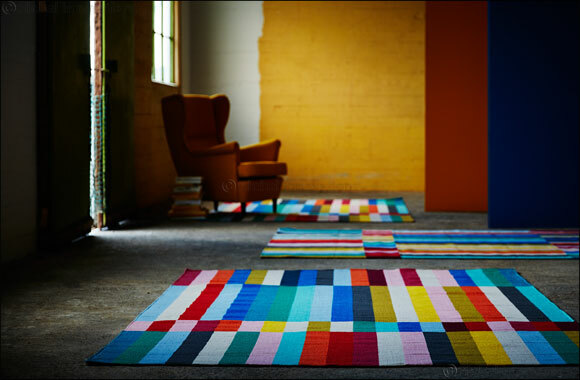 The wool rug is handwoven in an IKEA initiative of organised weaving centres in India with good working conditions and fair wages. The result is a unique rug that not only looks good, but a rug to feel good about too. This month sees the launch of five new metre fabrics that can be used to personalise and add some punch to the home. Many of the patterns have been created with inspiration from food, for example ORANGELILJA metre fabric features bright pieces of oranges, while PIPDÅN metre fabric shows kitchen utensils and food in an eclectic monochrome mix. The metre fabrics can be used in many different ways, maybe as a long tablecloth, curtains, cushion covers, napkins or even clothes - they’re just a great chance to get creative! THE NEW METRE FABRICS OFFER A GREAT CHANCE TO GET CREATIVE WITH BRIGHT AND BOLD PATTERNS. 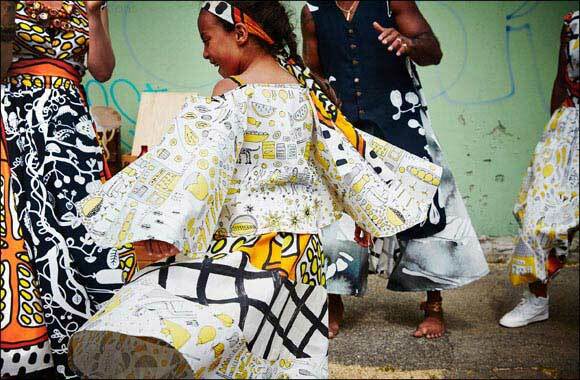 ALL THE METRE FABRICS ARE MADE WITH 100% COTTON FROM MORE SUSTAINABLE SOURCES, AND CAN BE WASHED IN 60 DEGREES. FROM VIBRANT DRESSES TO TEXTILE NECKLACES, ONLY THE IMAGINATION SETS THE LIMITS WHEN GETTING CREATIVE WITH THE NEW METRE FABRICS. Cooking and baking become so much more fun if you look the part. With TOPPKLOCKA child apron and chef hat kids can look like a professional chef and have all the real functionality of wear. The apron has a touch-and-close fastening that makes it easy to adjust and it also loosens easily if the child gets stuck. The chef hat is expandable and so fits all children. 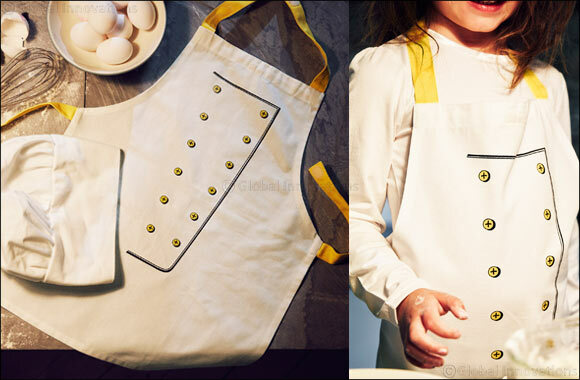 TOPPKLOCKA CHILD APRON AND CHEF HAT ARE GREAT WAYS OF STIRRING UP KID’S INTEREST IN FOOD AND COOKING. Made in durable stoneware, the launch includes differently sized bowls, side plates, paper napkins and mugs. In a natural colour scale with a dash of colour, FINSTILT dinnerware may inspire some creative mixing of patterns on the dining table! 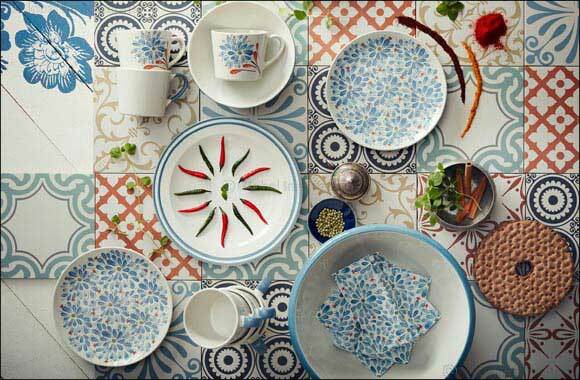 SWEDISH HERITAGE MOTIFS FROM DALECARLIA, A HISTORICAL PROVINCE IN SWEDEN, COME TOGETHER IN FINSTILT PLATE. WITH COORDINATED NAPKINS IT’S POSSIBLE TO CREATE A COMPLETELY FOLKLORIC AND FLORAL DINING TABLE WITH FINSTILT DINNERWARE. 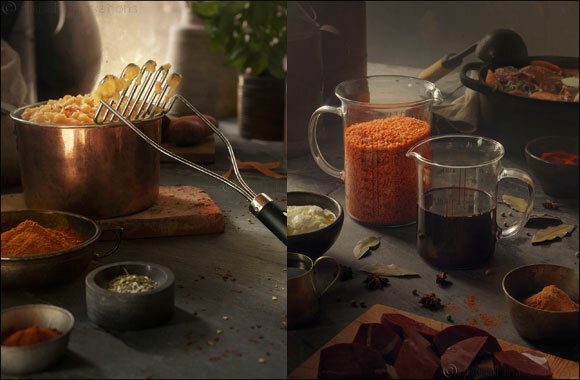 Complementing the dinnerware, oven- and bakeware already available in the series of everyday basics in a traditional style, this month sees the launch of VARDAGEN kitchen utensils. This time there’s a lot of focus on food preparation and measuring utensils with products such as jugs, a balloon whisk, potato masher and grater. Made in strong glass or durable stainless steel, the utensils withstand the wear and tear of daily use, while never going out of style. VARDAGEN MEASURING JUGS IN HEAT-RESISTANT GLASS ARE GREAT WHEN MEASURING UP FOOD OR LIQUIDS - AND THEY’RE DISHWASHER-SAFE. FOR GRATING ANYTHING FROM LEMON PEEL TO CHEESE, VARDAGEN GRATER DOES THE JOB WITH THE HELP OF A GOOD SOLID HANDLE. Good storage makes room for play, but great storage provides play – and FLYTTBAR storage series really does with trunks and boxes resembling real suitcases, some pieces are even portable! The idea for the series came about from a Play Report that IKEA conducted, where one insight was that people want to play more. Parents want their children to play as it’s important for their development, children want to play more as it’s fun and lets them be creative, children and parents want to play more together because it’s fun and a good way to spend time together! 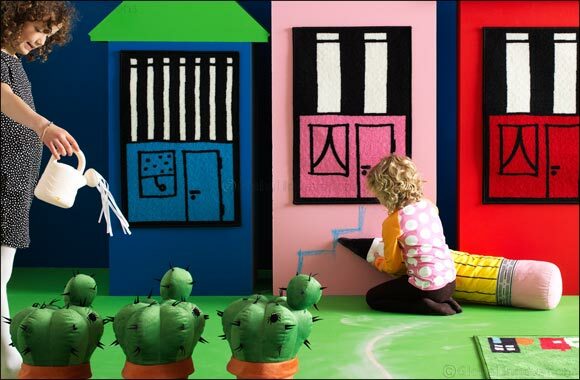 Play is learning for life, a way to explore, experiment, dream and discover. IKEA has a mission to bring more play to the world, and FLYTTBAR storage series is just one example of this. Packing, unpacking, piling things on top of each other, opening and closing, FLYTTBAR storage series invites for hours of important play (and organising!). WITH PLAYFUL CITY MOTIFS, FLYTTBAR BOXES WITH LIDS BECOME TOYS AS WELL AS STORAGE BOXES. 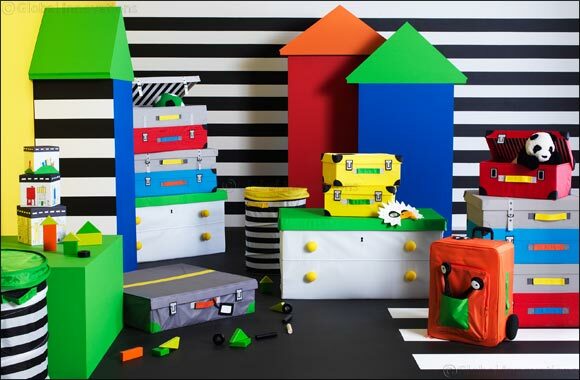 THE COLOURFUL FLYTTBAR CHILDREN’S STORAGE SERIES JUST INVITES FOR FUN WITH TRUNKS RESEMBLING REAL SUITCASES. With a mission to make the world play more, the HEMMAHOS collection stimulates and supports unlimited fun! Turning everyday objects such as a toothbrush or pen into oversized soft toys, these are sure to insipire hilarious play scenarios. Rugs with houses printed on help build fantasy worlds, not forgetting the bed canopy. A hopscotch rug brings a great outdoor activity indoors. 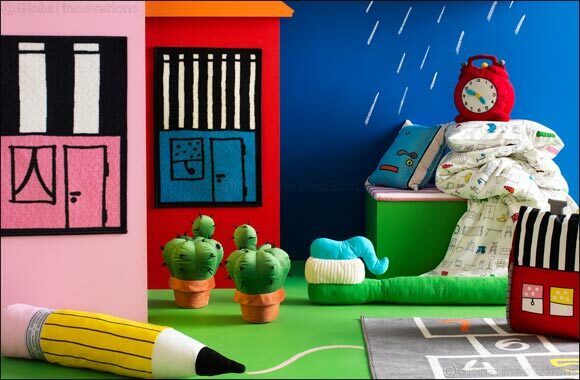 In bright colours, the HEMMAHOS collection also includes curtains, quilt covers and bench pads that all help to make the kid’s room a bit more jolly and play-friendly! The soft toys in the HEMMAHOS collection are part of the good cause campaign “Let’s Play!” - where for every sold toy the IKEA Foundation will make a donation of €1 to projects in some of the poorest communities in the world, supporting children’s development and learning, equal participation, sports and sports activities, and of course – play. WITH STARS AND CITYSCAPES, HEMMAHOS QUILT COVER AND CURTAIN INVITE FOR DREAMS IN 100% COTTON FROM MORE SUSTAINABLE SOURCES. SPRING INTO ACTION ON THE HEMMAHOS RUG FEATURING A HOPSCOTCH PRINT THAT BRINGS A GREAT OUTDOOR ACTIVITY INDOORS. IMITATING REAL OBJECTS, HEMMAHOS OVERSIZED SOFT TOYS ARE SURE TO INSPIRE HILARIOUS PLAY SCENARIOS.